You hear a rustle from a bush, muffled voices, is it the enemy or more of your team? Slowly and cautiously four figures start to step out from the cover of the bushes. There's a shout from one of your team mates on the high ground to the side, enemy!! Suddenly everyone in the ambush leaves their cover and opens fire. In seconds it's over and the enemy team have been eliminated. Pull on the combats, smear on the camouflage cream, grab your AK47 and you're ready to make your mark as an action hero!! Airsoft weapons are full size replicas of real world firearms that fire a 6mm plastic pellet at a safe velocity. These have the ability to fire single shots and full auto fire to really keep the oppositions head down. To start the day everyone will get a full safety brief outlining the dos and don’ts that allow all involved to get the maximum enjoyment from the day and an outline of your task ahead. Once kitted out with combat clothing, safety mask and weapon its on with the mission, will you go for a full frontal attack or go for the stealth option and surprise your enemy? ITS YOUR CALL, DEPLOY YOUR TEAMS!! Catch up on the latest news and see what other airsoft gamers are up to. Download a copy of the consent form by clicking the button below. 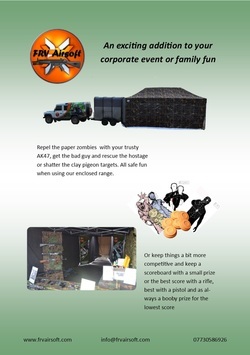 ﻿Bring the airsoft experience to you, with our mobile airsoft range we can set up at your location.